Gavin Patterson is to step down as the chief executive of BT as frustrated investors pushed for change. Mr Patterson has been under pressure from shareholders to improve the company's stock performance, which has almost halved over the last two years. Since taking on the role in 2013, Mr Patterson has splashed billions on buying football rights to attract customers to its pay-TV channels. He also spent £12.5bn to buy mobile phone operator EE in 2016. But the company failed to meet its financial performance targets and forecast flat profit growth over the next few years. A number of issues took the company by surprise or contributed to a sense of malaise, such as an accounting scandal at its Italian business that left a £530m black hole, talks with regulators over the fate of national broadband network Openreach dragged on and falling demand from public and corporate customers. Despite plans to keep paying a dividend over the next two years, as it slashed jobs and plugged a pension fund deficit, shareholders were pushing for a change of leadership. Jan du Plessis, the chairman of BT, said: "The Board is fully supportive of the strategy recently set out by Gavin and his team. "The broader reaction to our recent results announcement has though demonstrated to Gavin and me that there is a need for a change of leadership to deliver this strategy." Mr Patterson has been BT's chief executive for almost 5 years. 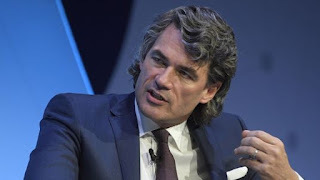 BT expects to have a successor in place by the second half of the year and Mr Patterson will continue to serve in the role until that time. BT's stock, which is at a 6-year low, rose 2.9% to 208p, while the FTSE 100 dipped 0.5% at the start of trading. George Salmon, equity analyst at Hargreaves Lansdown, said: "The rise of BT's Sport coverage, which has stepped up to challenge the dominance of Sky initially brought some good times for investors. However, it's been a different story over the last two years.